I want badly to identify the child that my great grand uncle James Pepperney is holding. It is unfortunetly too hard to tell without additional details. It could be my grandfather, Charles Lowry or another of his cousins. Based on the age of the photo, the pen ink on the bottom (unfortunetly unreadable) and similar photos like it, I place this photo in the mid-1920s. If anyone has any more details, please share! 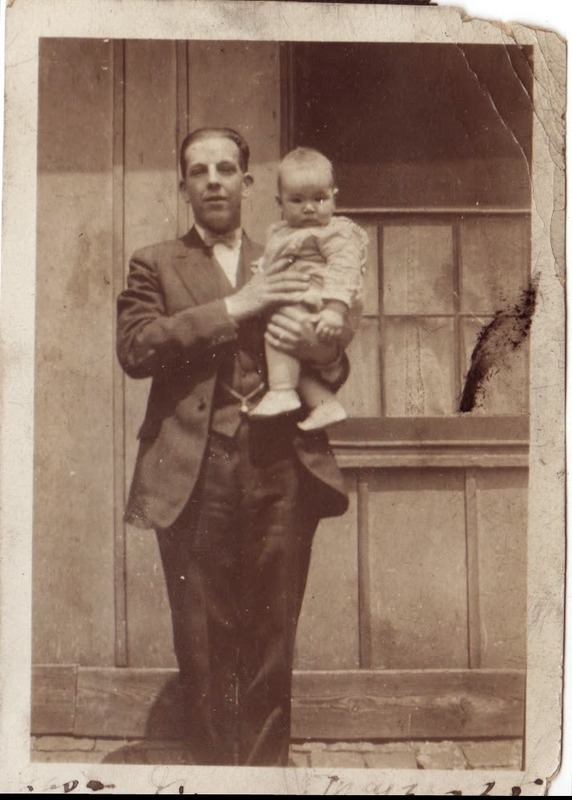 James Albert Pepperney, Sr. (1906-1999) and unknown infant, photograph, taken at unknown location in mid 1920s; digital image, photocopy of original, scanned in 2013 by Joseph Lowry; privately held by Mary McCaffrey, [address for private use], Canton, Ohio. Young man wearing suit holding an infant in front of a wood building. Provenance is Mary Pepperney Lowry to Charles Lowry to Mary McCaffrey.